When you envision a home in the Rocky Mountains, the Bar-M Getaway is exactly the home you picture! The Bar-M Getaway is perfectly located in the heart of the Wet Mountain Valley, just 90 minutes southwest of Colorado Springs, CO and three hours south of Denver. The log home sits on 10 acres with gorgeous views of the Sangre de Cristo Mountains and a peaceful setting with good roads and easy access to the highway and town. We are only 15 minutes south of Westcliffe, CO, a quaint little western town. It is an ideal base camp for your outdoor mountain vacation. Enjoy the feel of a luxury log home in the mountains! The area has numerous attractions for every age...The Royal Gorge Bridge and River Rafting on the Arkansas, Hiking in the Rockies, Great Sand Dunes Nat'l Park, Horse Pack Trips and ATV rentals are great choices. We like to horseback ride with Bear Basin Ranch! Westcliffe was awarded International Dark Sky status in 2015 and star gazing on the porch is spectacular. There is NO light pollution! The Bar-M Getaway has 3 large bedrooms, 2 big baths with double vanities, showers and a bathtub. The loft has a single bed and a game table. The cabin comfortably sleeps seven. Everyone can sleep on brand new beds. Enjoy the large great room, cozy gas fireplace and watch DVDs. There is a spacious dining room with a beautiful wood table that seats eight and a gourmet kitchen fully stocked with appliances, dishes and flatware. Paper goods, coffee and laundry supplies are provided. You have a microwave, washer and dryer, and dishwasher as added amenities. Who wants to do dishes by hand on vacation (or ever)? All the bedding and linens are new and top quality. The Sangre de Cristo Mountain range greets you from the loft and french doors in the great room. It is breathtaking! Hiking the mountain trails to pristine fishing lakes, horseback riding on a real horse ranch, whitewater rafting on the famous Arkansas River and fishing are within 10 to 45 minutes. Really! MAKE YOUR RESERVATION NOW TO TAKE ADVANTAGE OF THIS IMMACULATE LOG HOME! 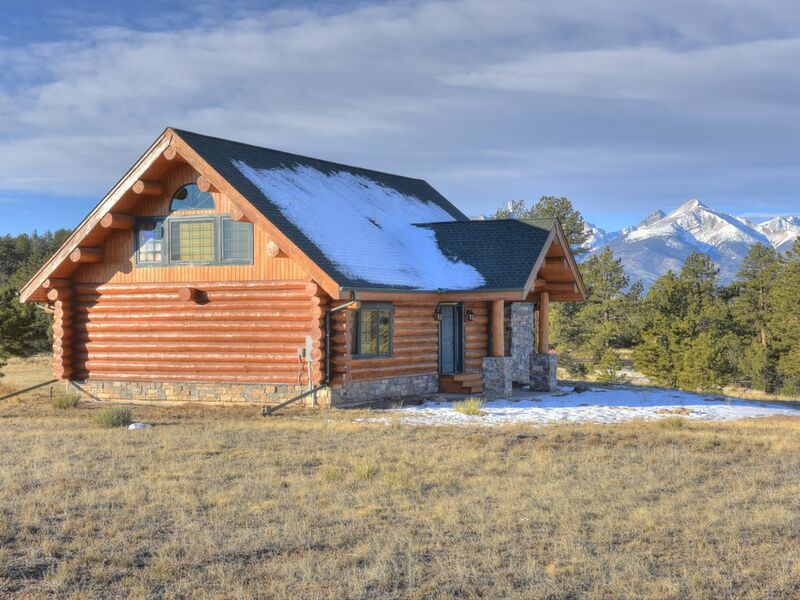 Keywords: Westcliffe Vacation Rental, Log Home Rental, Wet Mountain Vacation Rental, Mountain Getaway, Colorado Vacation Rental. Hi! I'm Beth Mosley. The Bar-M Getaway is our vacation home in the Rockies. We live in Minneapolis most of the year and love to share our property with guests when we are not in Westcliffe. Our family discovered Westcliffe and our home while looking for dark sky property in Colorado. We are amateur astronomers. We call Westcliffe "a diamond in the rough." The Bar-M Getaway is a postcard perfect mountain home that is beautiful inside and out. The views in the Valley are not better anywhere else in Colorado! Westcliffe is a perfect cowboy town, offering everyday conveniences and unique boutiques. The atmosphere is relaxing and scenic and the views are breathtaking! These are the features that sold us! toilet, combination tub/shower, Double sinks, waist high counter, and a deep bathtub. toilet, shower, Large walk in tile shower and double sinks. Westcliffe and Silver Cliff are friendly, quaint cowboy towns. There are no stoplights and only one franchise! The area is beautiful, and is home to a ranching community. Enjoy the magnificent Sangre de Cristo Mountain Range from the home, from the neighborhood, and from all the main roads. The views are everywhere. Forced air furnace works like a charm. The home is a full log home so the temperature is consistent. No AC is needed in the summer. High thread count linens and luxurious towels. New Whirlpool Front Loading , laundry soap is provided. New Whirlpool Front Loading, dryer sheets are provided. Park in front in the circle driveway, or in the back of the home. Plenty of parking space. Plenty of towels and wash cloths and bar soap are provided. Vaulted ceiling, gas fireplace with hearth, wood floors, 2 love seat sofas, end table. Full size with freezer and works very well. Gas stove top oven, and very clean. The burners work very well. The oven heats and bakes well. Good size and works well. 12 cup Mr Coffee , Coffee is provided. Stainless, toasts 2 slices of bread. Coffee, paper goods, dish soap, basic spices and condiments. 10 complete place settings, extra glassware, tupperware, serving pieces, salad bowls, baking sheets. Full size fridge, lots of counter space, stove top built in, oven, double sink, dishwasher. Great supply of baking and cooking utensils and dishware. Open to the dining room for easy conversations. Pretty wood dining table, seating for 8. Many useful reference books and maps of the area to facilitate hiking, back-packing, fishing, exploring and sight seeing are available to use. Also available are books to read. Loft, including game table for puzzles and board games. Many board games, cards, and puzzles are provided in the game chest in the loft. Many DVD's to watch, large variety. Large Picnic Table, brand new! Four camping chairs are in the front hall closet for you to use on the roomy patio. We have a large, brand new dvd library and new tv speakers. There are many books to read, and lots of family games and puzzles. Short Term Rental agreement is required. A Visa or MasterCard CC number is required as a security deposit. No hunting parties. Beautiful cabin n the Colorado mountains. We now have CO detectors in place and all faucets are working well. Thank you for bringing that to our attention. We appreciate it and look forward to having you again. We booked this beautiful cabin for two weeks during the Christmas holidays. The stay was wonderful. Everything was exactly as described in the pictures and listing. The cabin is in like new condition, with everything needed for a short or long stay. We got snow while we were there which made it more beautiful. Got to see many mule deer every day and even seen a very large bull elk about 200 yards away from the cabin. Lots of places to take short day trips to see or just sit back with some coffee and enjoy the scenery from the property. We had a great time and will definitely book it again. Rural Westcliffe, Colorado at 8,000 feet---comfortable cabin, responsive owner. The cabin will accommodate six persons easily. We reserved the entire cabin for the two of us. The only bed we used, the king master---very comfortable. We did not use the fireplace. We are not even sure if there is wi-fi or television. We were very content to enjoy the quiet. AT&T service iPhone works; other phone providers not so much. Owner lives in Minnesota and has a local property manager. Documentation for using the cabin is thorough. We would consider the Mosley cabin on a future trip to Westcliffe. We traveled to the Westcliffe area in hopes of watching the Perseid meteor showers. Beth's cabin was the perfect place. Westcliffe is a "dark city" so the skies were amazingly dark. My wife, daughter, and our friends sat outside on the front stoop and watched the amazing showers without even the slightest disturbance - unless you count the coyotes howling in the distance. The cabin itself is fantastic. The rooms are fun and well-kept. We cooked an elaborate dinner one night in the well-stocked kitchen. On the drive from the main road to the cabin, we saw deer nearly everyday. And, my daughter was able to stand 20 feet from a dow in the backyard one morning. Beth and her team are great. And, her place is fantastic. You won't regret staying there. We had a fabulous stay. We loved the peaceful location! We had ample supplies for the week and felt very at home. That k you for a wonderful time. We had s very good time at the Bar M Ranch. Beth Mosley was great to deal with. The cabin is beautiful and comfortable and Chris, the property manager, was very helpful. You are minutes from: national forest; fishing; horseback riding; mountains; quaint western town; groceries; ATV rental; white water rafting; fine dining; Royal Gorge.